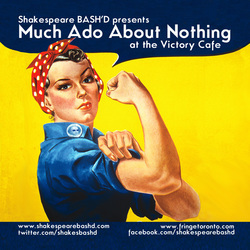 Shakespeare BASH'd presented Shakespeare’s uproarious,	clever, and at times	dark	comedy Much Ado About Nothing at the 2013 Toronto Fringe Festival. Sargisson). Hilarity	ensues	as	the	couple	succumbs	to	the	gossip,	rumors	and	“notings”	of	their	families. The production was a sold-out success, with critics and audiences thoroughly enjoying the hilarious and moving show.